I’m conscious of the posts I’ve made so far about our latest trip to Morocco not being particularly practical in nature, and possibly being a tad on the ‘grin and bear it’ side! I’ve also been very aware of all my blessings since returning home and it’s been easy to complain about the things I find difficult in our ‘second home’. I have a love-hate relationship with Morocco that leaves me feeling conflicted and contradictory. However, there are a number of things I’m already missing about Morocco. Obviously, I’m really missing seeing FreeToBeZ playing and laughing with her daddy; despite the infrequency of our visits, their bond is obvious and strong, and regularly brings tears to my eyes to witness. At home in the UK, I could think of myself as a ‘chaotic’ person. My mind is always on the go, I don’t get enough sleep, I perpetually strive for a more organised homelife, and there is always physical, emotional and mental ‘clutter’ (I could use the excuse of children for all of these things – in the spirit of congruence, it’s not just that!). 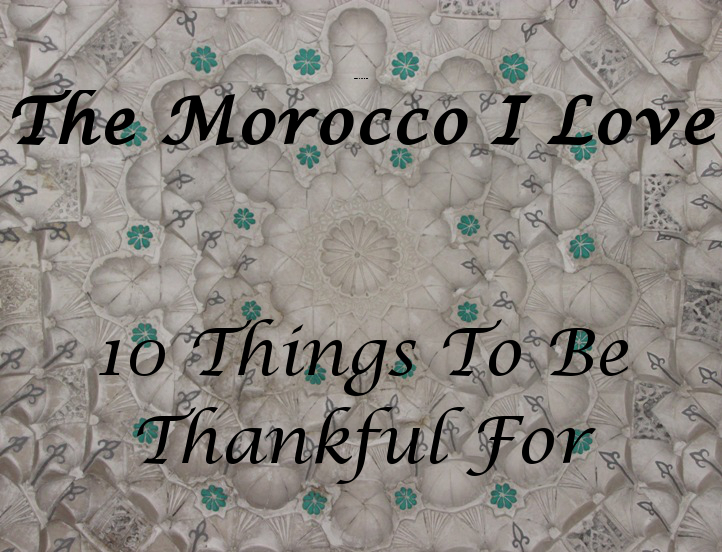 When I get to Morocco, I don’t see myself as chaotic at all – the external world fulfils that for me! Arriving two evenings before Eid for our last trip, it really achieved this label: I’d never seen the airport arrivals area so extraordinarily busy (and this was our 10th visit) and there were those people who were more observant of the queuing system-of-a-sort for passport control than others. Out into the streets and into all the traffic; the constant hooting of car horns, the heightened sense of anxiety as you try to cross a road without being mown down, the people who have less concept of personal space and ‘rights of way’ than I’m used to. Yet this makes any trip to Morocco immediately tinged with a sense of adventure. Your senses come alive – there is no way they can’t. And if they didn’t, you might find yourself in some undesirable situations thanks to your lack of alertness. Morocco truly is a place of contrasts – from relaxing on the ponj of a laid-back host who you’ve spent a sedate afternoon enjoying food with, straight into a mêlée of being squeezed along crowded backstreets trying to contain your handbag and your children whilst dodging scooters. I’m sure my blood pressure must rise and fall with interesting frequency when I’m navigating Moroccan towns. I say this and yet I’m so glad I know this. I’m so glad I’ve seen and experienced this side of the world and have the story to tell. I would urge others to make the trip precisely because of these idiosyncrasies of place. Every time I get back to the UK, I wonder at what ghost towns we live in. Where are all the people? Mostly stuck indoors or transporting themselves around in cars. And when there are people forced together out in public – on trains, queuing for various services, in the supermarket – where is the chatter? Whilst I’m hardly one to complain (being someone who is generally shy to start up conversations with strangers), it strikes me that this reluctance to interact is not just personal but cultural; my traits have always felt at odds with my instincts. Even in the ‘quiet’ suburbs of Marrakech, the streets are alive – there are always children playing and adults casually chatting with the kerb as their seating. Whilst there are plenty of cars in Morocco, there are also those who travel by mule or donkey or horse and carriage, or market traders who transport their goods using a handheld cart, which enables those people to be more contactable and present with the pedestrians they share the space with. There are many reasons for this difference that means it’s not a lifestyle easily recreated in the UK. The weather is often a big deciding factor in whether we’re outdoors or not, and yet there certainly used to be more suburban street life in English cities too. Without going into the politics and cultural changes that have happened in the UK to destroy communities and encourage people to live more isolated lives, I love the fact that I can exit an apartment in Morocco and know without doubt that the street will be vibrant with the sound of children playing, animals braying and the calls to go praying. Between buying fresh croissants and crepes for a matter of pennies from a local patisserie and sipping on freshly squeezed orange juice from the deliciously sweet native citrus fruits, breakfast food here is imbued with an energy and vibrancy that I just don’t get from our usual morning routine involving a box of cereal and a carton of a long-life dairy-free milk alternative. Combined with the fact that they make bloody good coffee in Morocco, and the start of the day is usually a good one. Whilst out on the town and for just 4 Moroccan dirhams (about 30p) you can enjoy a tall glass of freshly squeezed orange juice in Jemaa El Fna square – at that price, there’s no excuse not to! There is also an amazing array of different fruit juices and smoothies made to order in many restaurants and cafes that we just don’t find back home unless we were to head for a specialist (expensive) juice bar. And, saying that, I’m not sure I know where to locate one of these in my local area. Not to forget the figs, olives, almonds and other native foods that are much better in their fresh form than anything you buy in packs at the supermarket. Whilst it can often be a hand-to-mouth lifestyle that ensures many people here eat fresh produce, there is also less emphasis on the supermarket and more emphasis on market culture and seasonal goods. Many people in the towns also seem more inclined to go out in the mornings and bring fresh breakfast in rather than expecting shelves, cupboards and fridges to be stocked. And FreeToBeB – brought up eating daily-made bread in the family’s traditional outdoor, earthen oven – is often surprised that I’ll happily eat yesterday’s bread in preference to buying the freshly made breads each day. Even against 24 hour old Moroccan flatbreads, our long-life sliced and packaged loaves just can’t compare. 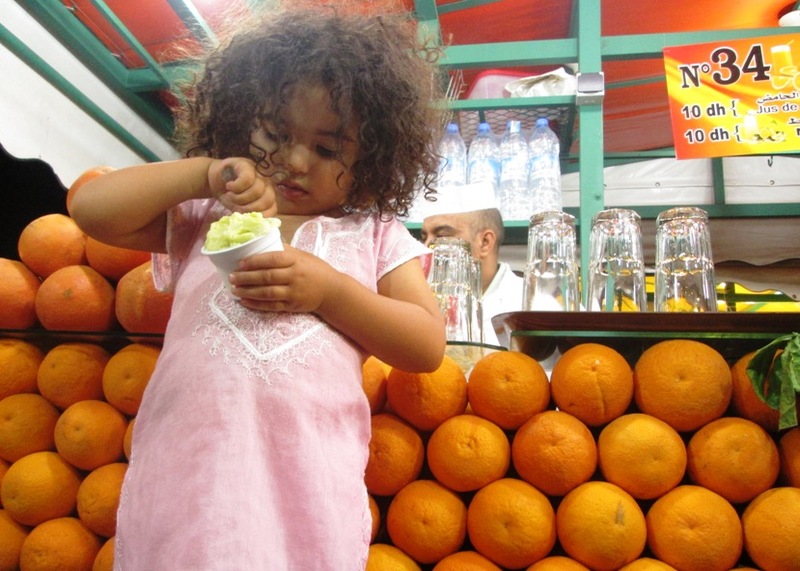 Yes, we may be able to buy freshly prepared food in some shops back home – but the ubiquity and low cost of it in Morocco makes it the easy choice there, whilst it may be the more expensive and less convenient choice in the UK. It really brings home to me how lifeless are some of the packaged foodstuffs that are supposed to sustain and satiate us. The difference is also reflected in the cooking and the sharing of food – this is only a thought, but I’d say that the way in which Moroccan people are proud of their cuisine as they earnestly encourage you to share in their meals (“Koul! Koul!” – “Eat! Eat!”) is a reflection of the true life force apparent in their food resources. OK, so this is a matter of whether you are in town or country. If I think about the natural environments around me, nothing beats the sight of green, green England as we come in to land after a North African excursion. How fresh and lush and brimming with life it appears; I missed this usual view as we came into land at nigh on midnight earlier this month. I wonder if Moroccan people love their ochre landscape as much as I love my green? However, take to the high street and the drab, dispirited monoculture of a typical British town is apparent. I don’t care how well a chain store thinks it’s dressed its window, it’s not a patch on the flood of sights that comes with a walk amidst the market of a Moroccan city. Whilst I’m not a keen shopper and would rather not focus on material goods, I love wandering the souks of Marrakech and being charmed by all the colour and glitter and exuberance around me. Yes, you could purchase something as a reminder of your visit, thinking that the vitality of the items will remain, but – just like the picking of a flower – something of their life-force invariably falls away once they are set apart from their original backdrop. 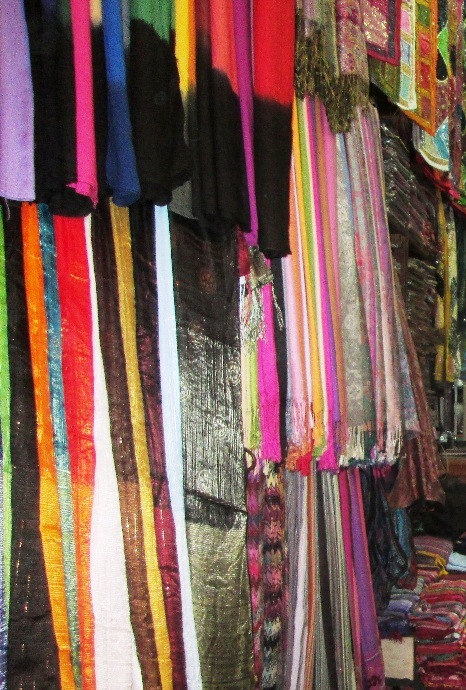 Every shade of the rainbow is everywhere to see and the beautiful clothing and jewellery makes a feast for the eyes. The joy isn’t in purchasing single items of these delights but in seeing them all together in a jumble of hues and patterns and textures: piles and piles of unabashedly embellished and gleeful garments in the clothing stores, small shops crammed to the ceiling full of shining thuya wood products, ceramic diningware decorated in intense colours and swirling patterns, florid and flowery offerings at the textile merchants . . .
. . . Not to mention the scents wafting from spice shops and cosmetic sellers. From the bright and showy pyramids of turmeric and cumin, to the smoke of incense blooming from a stall of hammam products, the combination of the sights, smells and sounds of the souk come together to remind me of the beauty and vivacity of life. The effect is kaleidoscopic and I could spin myself around admiring it all for hours. 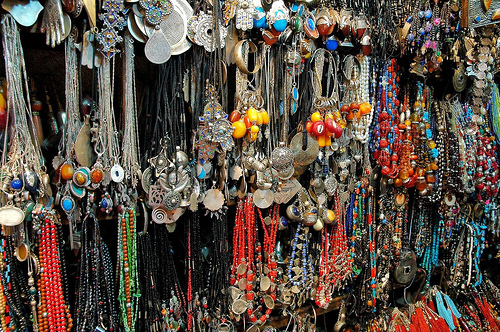 A jewellery shop in the Marrakchi souks. To see more of what I mean, you might like to visit my Pinterest board ‘Morocco’ dedicated to the delightful side of this country of contrasts. While this can sometimes be frustrating, if you want a peaceful break free of pressure, it’s helpful to take on the Moroccans’ mañana attitude. It’s a good attitude to adopt for any family break (emphasis on the fact that a holiday should indeed be a rest from the usual daily grind!) and taking it on in Morocco will ensure your increased immunity against impatience at the sometimes slow and seemingly unreliable pace at which things often appear to get done here. You can be asleep at any point of the day here (or up and about at any point during the night) and it’s perfectly acceptable. This is particularly true during the long, hot summer days. Things get done when people feel like getting them done, so little does the structured, time-bound mentality of what I would consider a ‘usual’ working day penetrate many people’s lives here. And yet – everything gets done. I’ve spent a lot of time in Morocco just waiting. And often not even knowing what exactly I’m waiting for. Just knowing that in order for the next thing that needs to get done to get done, I must bide my time and trust the process. From a world of appointments and general punctuality (I shall never again complain about the length of wait at a dental practice), I could see this as a con rather than a pro of my time in Morocco – but it’s yet another practice in mindfulness. I’ve had time to sit and reflect, hence why so much writing comes of my trips. I’ve had time to sit beside my demons of impatience and judgement and talk them into angels of patience and acceptance. I’ve had time to savour the food at my lips instead of rushing the routine of mealtimes. I’ve had time to sit and listen and absorb the social discourse around me, more rather than less intriguing for its unintelligible vocabulary. And it has taught me that there is time. It is ‘stuff’ that gets in the way back home. Stuff I would rather relegate to the recycle bin so I can sit and just be with my children, sit and just be with my self. The people of Morocco are famed for being some of the most welcoming, hospitable people in the world. Indeed, a recent study by the World Economic Forum found Morocco to come 3rd in a report of the most welcoming places for foreign tourists to visit. It’s taken me a while to get over some of my typical British politeness and make the most of this. Indeed, what may be considered more ‘polite’ over here can be seen as a snub to your hosts over there, especially if you refuse a glass of the ubiquitous sweet mint tea whilst everyone else is cheerfully partaking. 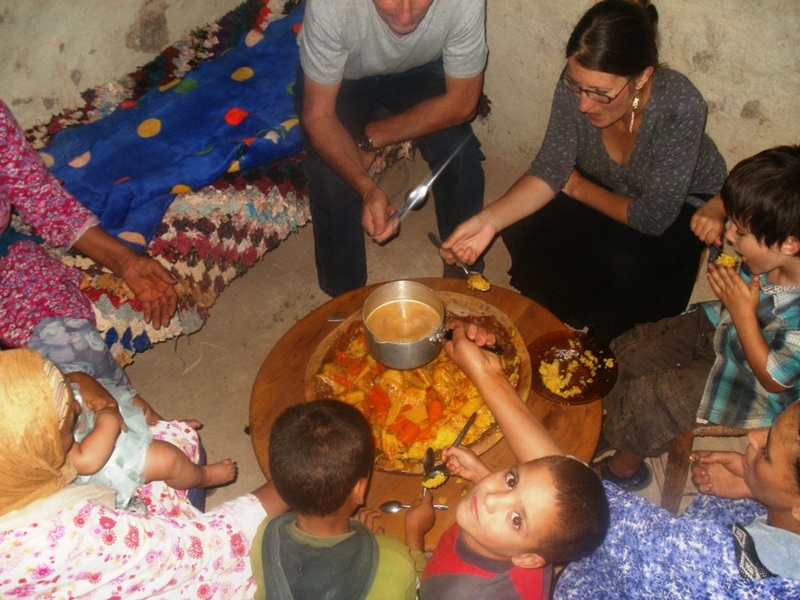 Family-sized cous cous during a trip into the Atlas Mountains in 2012. Clockwise from top: my father, me, FreeToBeP, FreeToBeZ’s auntie, two of FreeToBeZ’s cousins, FreeToBeZ’s grandmother, FreeToBeZ, and a family visitor. That said, there have been times when I’ve been embarrassed by the level of generosity we’ve been shown, especially when it’s been unplanned and I feel we’ve had nothing to give in return. We once had a really sweet guy named Hicham guiding us around Fez (he was a school teacher on his summer break and was with us as a compassionate companion rather than a guide looking to make money out of us). On our second afternoon with him, he took us back to his parents’ home for a meal. It was an elaborate meal and was followed by their encouragement for us to take a post-meal nap by curtaining off an area of their living quarters so that the ponjs (Moroccan sofas) could take on their alternative use as day beds. So we – strangers to them – passed an hour or so privately chilling out in their living room. As if this wasn’t enough, before we left, the matriarch of the house (who must have already spent hours preparing food in the kitchen) then insisted on pressing various items of costume jewellery and cheap but pretty bracelets into the hands of myself and FreeToBeZ – even after FreeToBeZ had already broken one such bracelet, tiny beads bursting across the tiled floor. I frantically tried to reject the jewellery in embarrassment (I should be bringing the gifts as a guest! ), but our hostess wouldn’t have any of it; smiling and laughing and nodding, she insisted I take her offerings and I eventually accepted as graciously as I could amidst my discomfort. I also get worried every time I ask to change FreeToBeZ’s nappy in someone’s home. I’m always just looking for a patch of floor that they’re happy for me to change a soggy or dirty disposable nappy upon, and am invariably asked if I wish to give my daughter a full strip wash at the same time, usually accompanied by the lady of the house rushing to find soap and towels. This in itself isn’t a problem. What is a problem is someone assuming that this is what one wishes to do without both parties having a mutual understanding about what is about to happen . . . But this is a whole other story . . . However, I will never forget how observant and human some people have been about genuine needs. For a week during a stay in 2013, we were accommodated by local people in two different cities when all the rooms were full at the inn. I will never forget the relief of hearing that Halima, a bolshy and outspoken Rifian lady in Al Hoceima, had kindly offered us her sitting room to stay in when it was nearly midnight and we still hadn’t found a bed for ourselves. As she walked home on that hot August night, she saw a family taking shelter on an empty shop floor and spontaneously opened up her home. We paid her more generously than I am generally willing to pay Moroccan hotels – and I can’t even be cynical about her intentions of inviting us (knowing that some people here see a European person and simultaneously see money); for when she first saw us she thought we were entirely a fellow Berber family, and not just because of FreeToBeB’s ability to claim this (it turned out she thought all European women used pushchairs for their infants – FreeToBeZ worn closely to me in a sling was enough for her to decide to distinguish me as a fellow Berber woman!). Pretty much the same thing happened again just 3 nights later in Chefchouen, and we spent a wonderful 5 days relaxing in the spare living quarters of a kindly older widower. If anything, it has given me all the more faith in travelling ‘on a wing and a prayer’, not to mention faith in the kindness of humans who have not been jaded by the ‘stranger danger’ mantra so prevalent in Western societies. I’m all for a more simple life. It takes a lot of discipline and a big change of perspective for someone brought up in a commercial culture. And, whilst I often complain about how difficult it is to cook on a single ring over a gas bottle or to have a proper wash with just a bucket of water and a jug, in reality it’s only difficult because of all the luxuries I’m used to. There is no excuse to go hungry or to not be clean when you have the means at your disposal. OK, if I actually lived in Morocco I’d ensure I have a decent electric oven with at least 4 cooking plates and a wet room big enough to install a ‘proper’ bath, but – as with camping – it can be good to get back to the simple life, even if it is just a way to truly appreciate what we take for granted in our own homes in better-off countries. I tried to embrace the simple things in life as much as possible during our latest visit (see Embracing the Ennui: Retreat, Respite and Relaxation), as I’d previously struggled with it during visits to FreeToBeB’s mountain home. For all the daydreams of a ‘back to nature’ lifestyle of self-sufficiency in an unspoilt landscape, reliant on community and surviving (literally and economically) on home-grown produce . . . the reality can be harsh. Yes, being amidst the Atlas Mountains and a group of people I was unable to verbally communicate with whilst they clean sheep innards is very different to, say, joining a vegetarian English commune in a field in Devon, but the point is valid: romantic, rose-tinted ideas of ‘the good life’ are naïve and impractical. In order to enjoy a simple lifestyle, the first step isn’t necessarily about diving into the embodied experience of it but in changing your perspective of what is already around you and slowly forgoing the things that don’t genuinely serve you. Since returning from our latest trip, my de-cluttering project has resurfaced with a vengeance. There is a tidiness to the simplicity found in Morocco. Not only is the home tidy due to lack of ‘stuff’, but it makes everything else seem tidier – easier. Rough play with the kids becomes an almost anytime possibility when there isn’t a floor full of toys to trip over or various breakables dotted about the living space that douse the fire of playful spontaneity. True presence and communication with the people you are sharing your space with becomes more attainable when one isn’t constantly distracted by the ‘things to do’ that come with living a complex, modern life. For all the talk of ‘modern conveniences’, many things that are supposed to make life more convenient actually make it more complicated, or at least less fulfilling. We race around partaking in ten quick and convenient habits when – psychologically and spiritually – we may yearn for two more involved jobs performed mindfully. Honestly: I would rather spend a morning engaged in bread-making with my peers as the children run around together than to spend half an hour in isolation preparing ingredients for and later washing up the equipment needed to bake bread in a machine, potentially in a rush whilst trying to get the kids out of the house for a social ‘appointment’. This concept of making an appointment to pop in and see your friends is something else that is alien in Morocco – again, it comes down to ideas of convenience and inconvenience. And this is why I operate an ‘open home’ policy with my friends (that is, proving this point, rarely taken up) – I never want my friends to see their presence as an inconvenience to me, to think that I might have better things to do alone than could be gained from connecting with another human being. We’re social animals; and in the vast array of things to do, places to be and material matters to attend to, this basic fact is becoming lost in ‘developed’ nations. When material possessions that are surplus to genuine needs are set aside, we may actually appreciate what is truly necessary for a whole and healthy life. In many ways, I can relax in Morocco with kids in tow. I will soon be posting my top tips of things to take into consideration when travelling with children in Morocco (mainly about the not so relaxing stuff! ), but one thing I can say with confidence is that no-one will mind you bringing your kids. If anything, people in Morocco generally take great joy in children and, when I travelled without FreeToBeP this summer, he was very much missed by those who expected him to be with me. From breastfeeding an infant to having my kids become over-excitable whilst out and about, people here look upon the natural and typical behaviour of young children with endearment and acceptance. I have no fear of any tut-tutting as I breastfeed in public or while my toddler has a loud meltdown. And thanks to the relaxed state of mind that this lack of tut-tutting fosters in me, my children are also more relaxed, ergo I have less fear of my children even having said meltdowns. Children playing in the streets late into the night is a common sight and sound. On hot days when families have been indoors having siestas, the whole family may come out at night to enjoy the street life, and this fits in well with my own relaxed attitude about bedtimes (whilst we have a routine, we do not have a schedule!). Many so-called ‘attachment parenting’ beliefs and practices I try to live by are taken for granted here – there is no label, just women doing what they have always done to birth and raise their children naturally (homebirth, breastfeeding, babywearing and bedsharing). These are all things that I instinctively felt drawn to do as a mother that have been overshadowed in Western societies by the medicalisation of birth and the commercialisation of babyhood. This is not to say that I agree with all the parenting practices that are at play in Morocco. 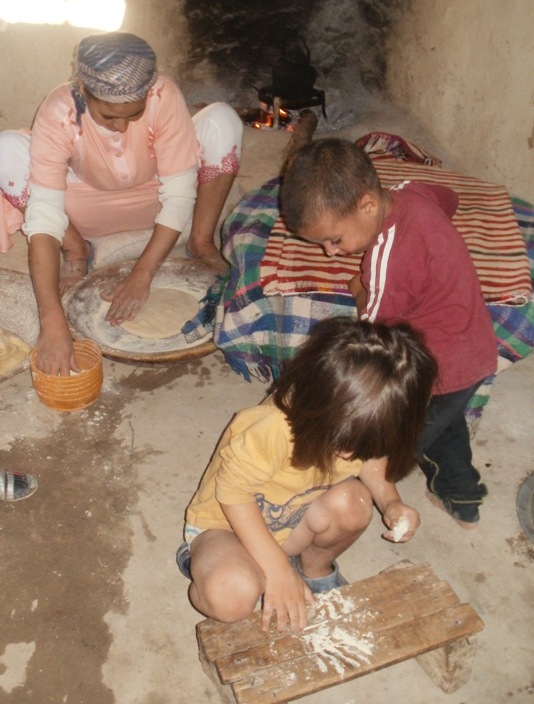 I know that the ‘good’ behaviour of many Moroccan children is less about respect for the parents than fear of The Stick (physical punishment both at home and in school seems to be a socially acceptable tool for eliciting cooperation from a child). And yet the positive bonds of family and community are obvious – the shared laughter as families gather together in their living quarters during and after evening meals; the acceptance of children as part of the community after the 9pm watershed; the ease with which the people here will pick up and dust off crying children who are not their own; or merely the planting of kisses and tousling of hair performed in the unselfconscious manner of those who are comfortable being around and showing affection towards the younger members of our human family. 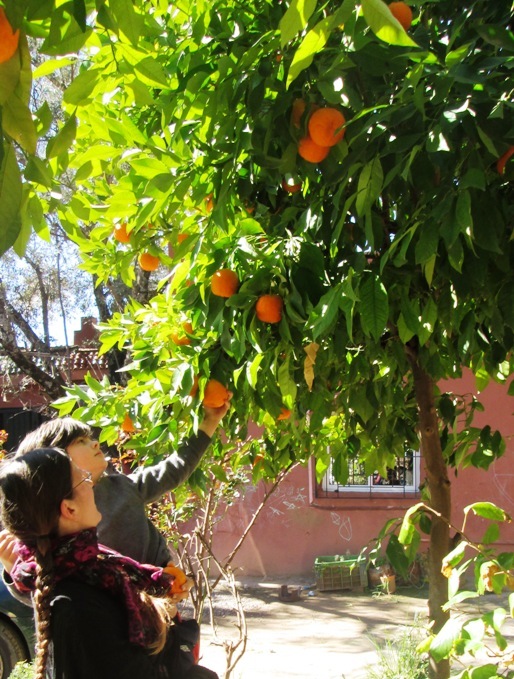 Whether out in the wilds of the mountains or in the centre of bustling Marrakech, there are plenty of sights to see for those interested in animals and plants. If you’ve got young children in tow, excitedly spotting horses and donkeys will soon become second nature in both town and country. Whilst in the city much of what you see can’t be classed as ‘wildlife’ and there is often suspect animal welfare, it can’t be denied that there are novelties to be enjoyed. 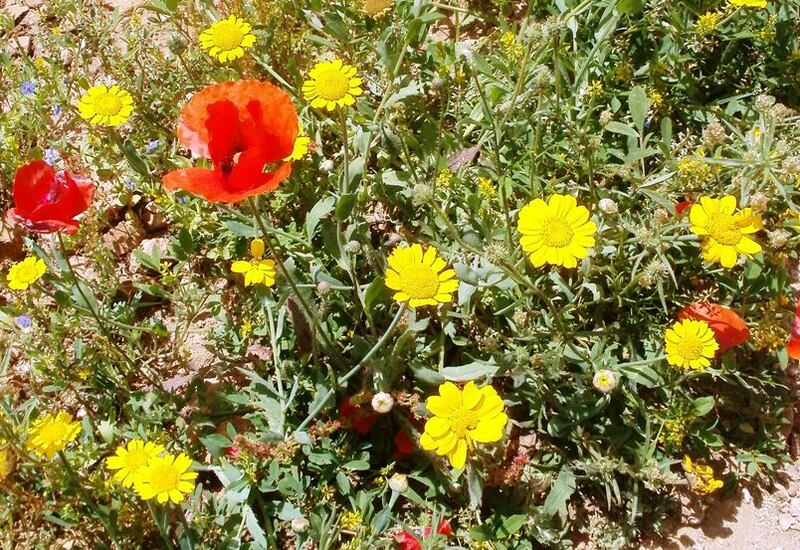 In Marrakech alone, there are plenty of intrigues for anyone interested in natural history. Merely taking a taxi into town, budding botanists can spot palm trees (this might be more ‘exotic’ for some than others; here on the Jurassic Coast we’re already quite spoilt for more Mediterranean plants and trees), orange trees, olive trees, Damask roses and various succulents surviving in the arid soil. If that’s not enough to satisfy your thirst for greenery, Marrakech boasts a number of gardens that can be worth a visit. Whilst I primarily wish to share information about things you can appreciate for next to nothing, I would gladly part with a few pounds again in order to revisit the Majorelle Gardens. A visit to the pool of Marrakech Manara will grant you a view of half-tame fish which come to the surface to be fed. Storks roost on the roofs and wide walls of tall buildings, including the minarets of the mosques. Mules, horses and donkeys are common sights at the roadside and upon the roads, and camels are brought into the cities as tourist attractions (but the obvious thing to do if you want authentic camel memories is to make the journey to the Sahara). Jemaa El Fna in the daytime can be like taking a trip to the zoo: snakes, monkeys, birds and other creatures are taken for display – you can look at these from a safe distance (safe from being encouraged to part with money that is) or for a small fee can have your picture taken with them. In the mountains I have seen some beautiful butterflies and huge, sleek millipedes, as well as snakes, scorpions, and the evidence of wild boars. The mountains can be quite colourful in the springtime with swathes of flowers. The cacti of the prickly pear is also easily spotted along roadsides and around villages – the abundance of them is evident in the amount of fruit that is left unpicked (think of them in terms of the humble British apple tree!). 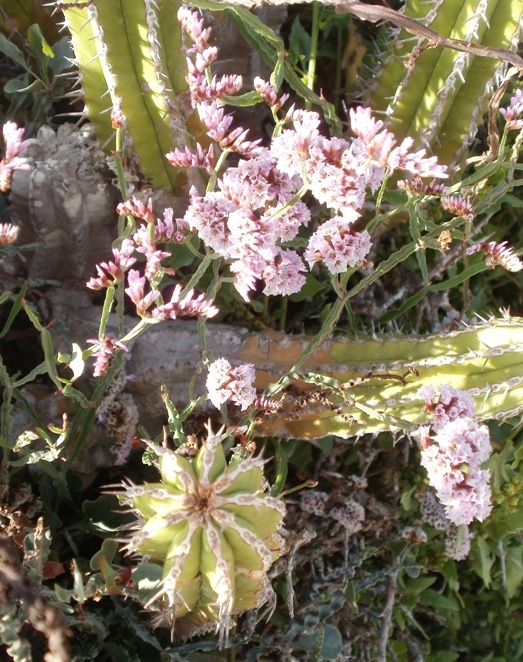 There are also many herbaceous plants which the local women pick in order to use for medicinal purposes. 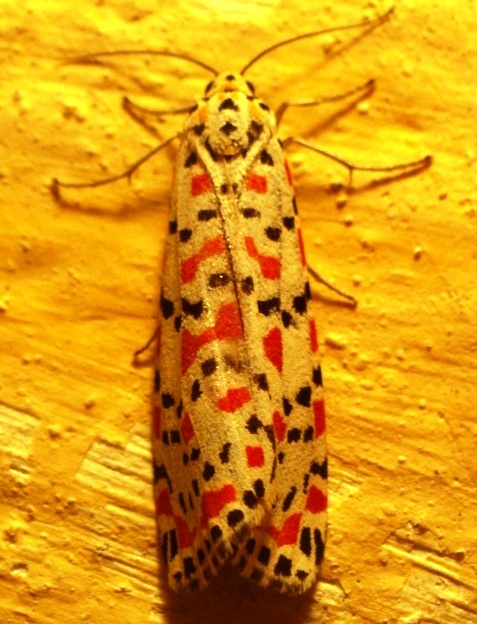 We have had our curiosity piqued by the array of insects we’ve spotted, all the more enticing to look at precisely because we don’t know if they’re things that could bite or sting us. Judging by the way I’ve seen some of the locals react to the sight of a spider – and assuming they don’t just have tendencies towards arachnophobia – I think it’s probably safe to say that there are resident arachnids that could cause harm to humans. And I’ve already detailed our encounters with cockroaches. Thus my next step is to find the Moroccan equivalent of my trusty ‘British Wildlife’ book. 10) Sun, Sun and Sun! Last but definitely not least: glorious sunshine and dry heat is a huge plus point. In Morocco I can pretty much forget that I’m medicated for asthma. The dry heat is really good for my lungs and barely a wheeze escapes me. Yes, it can get too hot during the day, but the simple solution to this is that you adjust your expectations about what happens when. During our summer trip we were getting up during early afternoon, having an extremely late breakfast, eating lunch at teatime and then heading out for the ‘day’ when it had cooled down a little (to about 36 degrees Celsius that is) at around 6pm. Whatever the thermometer may say, I find the dryness of North African heat much more bearable than the humidity of a ‘hot’ day in the UK. In my opinion, a dry and clean 35 degrees is much preferable to a sweaty 25 degrees! Aside from general sun-seeking and the knowledge that both your physical and mental health are being given a boost thanks to the production of vitamin D and serotonin, the other bonus is in the small joy that is knowing your clothes will be bone dry within the space of a couple of hours after washing them. In writing this, it would seem that the love-hate relationship I maintain with this country really is due to focusing so much on the contrasts and comparisons that a more objective view is obscured. For wherever you are, there are pros and cons, highs and lows. For whatever nuisances and inconveniences exist, there are so many things in this world that have the power to brighten our day. Looking back on this list, the things that have the power to uplift – the things that really matter – are invariably day to day experiences that cost nothing, yet lend to us a wealth of spirit that can make any place a pleasure. On this note, I’m off to make myself an avocado smoothie and eat some self-imported Atlas almonds . . .